Across the world, higher education is rapidly changing. Universities are increasingly seen as key engines of a ‘knowledge economy’, producing the innovation and the workers crucial to new industries. Driven by rankings that claim to measure ‘world-class’ status, and by the incentives and liberalised regulations of national governments, many universities are promoting themselves as ‘global’ institutions and competing to attract renowned researchers, international students, and grant income. These changes are profound—they reshape the long-standing relationship between universities and the nation-state, and reconstitute opportunities for social mobility, and the way millions of individuals see, understand and navigate the world. They are changes that, put simply, are deeply political. These shifts often go under the adopted narrative of the ‘globalisation of higher education’—a discourse which tends to treat this new terrain as largely a smooth space through which people, money, and knowledge travel seamlessly, a-politically, and for the mutual benefit of all involved. Such analyses, however, tend to under-estimate the competing interests involved in these changes, and the asymmetrical power relations and political contestation at local, national and regional levels that are configuring and reconfiguring contemporary higher education in ways that go well beyond the initial expectations and imaginations of the actors involved. To understand the ways universities are engaged in these processes we need to think in terms of a transnational politics of higher education. Higher education institutions do pull (and push) people, money, and knowledge across borders, but they do so in highly uneven ways. National, regional, and local boundaries are not simply transcended by these connections, but continually work to condition the nature of movement, and to direct and shape it. Higher education institutions find themselves operating within a transnationally striated space marked as much by difference, competition, and particularity as by the convergence around a ‘global’ model or market. While there are common pressures that force universities to act in similar ways, these pressures are not uniform, impersonal or universal. The transnational forces of neoliberalism, global ranking systems, American hegemony, and the functional exigencies of economic integration often play out differently in different locations. And they are, moreover, continually being made and re-made by actors with a variety of objectives. Within the worlds of higher education there exists significant variation across institutions—variation that, in some cases, seems to be growing rather than diminishing. It is not apparent that developments in Europe, Middle East, Asia, Africa, Latin America and North America are necessarily aiming to achieve the same ends, or even using the same methods. Understanding the profound transformations we have seen in higher education during recent decades means attending to this variation, as well as to its causes and consequences. 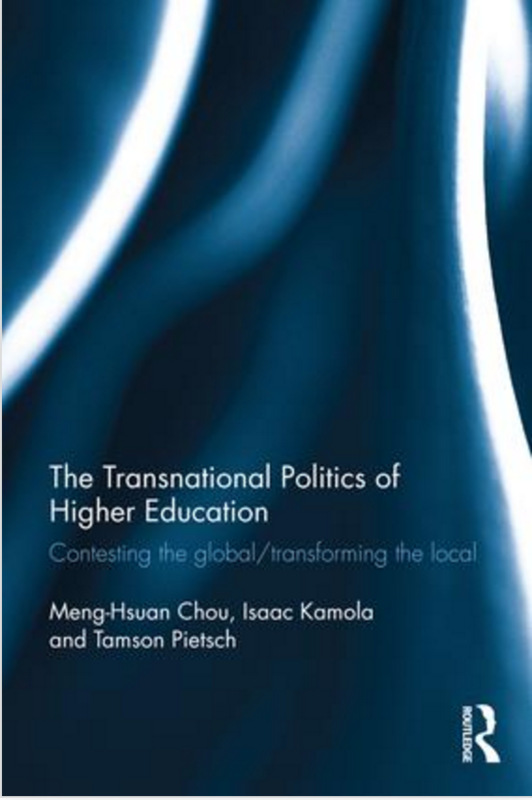 As argued in our recent book, it means attending to the transnational politics of higher education, and to three core attributes that help to fashion it. First, those interested in the politics of higher education in the present need to take seriously the history of the university and the ways in which its relationship with empire, nation and class is being refashioned in the era of market capitalism. It is no surprise that wealthier institutions are well placed to navigate the changing winds of local and ‘global’ imperatives. It is they who have taken the lead in offering online courses, leading big collaborative and high investment projects; they who tend to rank highly on research measures and have the ability to negotiate to their advantage with governments at home and abroad. European empires and the languages and religions that travelled with them, sit at the heart of these temporal legacies. They created deep cultural and economic infrastructures that continue to determine routes of travel and shape the global landscapes of knowledge and expertise. Second, we need to consider the way university reforms are enacted at national and institutional levels, leading to radically different outcomes in different contexts. For example, the wishes of international financial organisations or norms around academic freedom often find themselves in conflict with the wishes of national governments, local citizens or institutional administrations. This was the case for post-apartheid higher education in South Africa where the language of the university as a site within a ‘global knowledge economy’ quickly replaced the arguments promoted by anti-apartheid activists who envisioned higher education as emphasising democratic citizenship, de-racialisation, and economic redistribution. This outcome stemmed from the interventions of international institutions, funding agencies, and philanthropic organisations, as well as domestic political actors, who favoured the language that conceptualised the university as strictly an institution of economic development. The ability of South Africans to produce their own, potentially fairly radical, understandings of higher education was thus foreclosed. By contrast, while the so-called ‘American model’ of higher education has travelled to the Middle East in the form of branch campuses, these campuses have been required to incorporate the unique kefala system, which rigidly controls all foreign labour. As a consequence, the notion of ‘academic freedom’ supposedly embedded in the American model of higher education continually comes into conflict with very real frictions on the grounds. In these moments of tension we can begin to understand and identify the various national and international actors who have a stake in ‘globalisation’, and how they advance and protect their claims through and within it. Third, we need to develop a more careful consideration of the importance of geographic regions and the ways in which they are emerging as new players in the governance of tertiary education. As regional organisations become increasingly involved in the business of higher education, we see political processes driven by supranational forces that both work through and bypass national agencies. Yet even these regional processes are inflected by distinctive local and national pressures and ambitions. Regional influences, for example, have been extremely powerful in ushering in reforms in Europe. Policymakers in newly emerging democracies such as Croatia, Serbia and Slovenia accepted that restructuring their national higher education system was part of the strategy to ‘return to Europe’ after the fall of Communism. University actors there also saw the opportunity provided by Europe’s Bologna Process as a way to reform university governance according to their visions of faculty independence vis-à-vis university administration, and university autonomy vis-à-vis state control. But the purposeful activation of constitutional and legal provisions, and the different national policy formulation procedures involved, has generated variations of higher education reforms in these three countries. EU efforts directed towards standardising the recruitment of researchers to higher education and research institutions have also proven to be incredibly challenging. Similarly, governments in Asia have invested huge sums to upgrade their national flagship universities from teaching-oriented to research-intensive institution – a process that has involved alliances with foreign institutions, international staff recruitment, and attracting overseas students. But in practice the reports of scientists and scholars reveal there are still many on the ground implementation challenges especially in the realm of new ideas, critical questioning, transparent decision-making, academic independence and basic research. It is thus essential to attend to the various vested political and institutional interests during implementation to see how they translate external reforms for domestic and institutional purposes. Universities and the individuals who work in them are both local and global actors. They are rooted in specific social, political and economic communities, yet their authority comes from their claim to be representatives of a culture and learning that is apparently ‘universal’ in that it is recognisable and even tradable beyond the boundaries of particular localities. To maintain their status and power, universities need to maintain their relevance on both fronts: they need to meet the political, economic and social needs of particular regional and national contexts, and they need to sustain their connection to changing culture and knowledge. Far from converging around an imagined ‘American model’ or fragmenting as a consequence of ‘crisis’, across the world universities are operating as savvy political actors, working within complex, changing, and multi-scalar processes, and producing and reproducing the social world of higher education in highly heterodox ways. Seeing them in this way helps us understand the unequal geographies or ‘worlds’ that characterise contemporary ‘global higher education’, the parties who stand to lose and gain by its new alignments, and the transnational politics that helps to fashion them. Meng-Hsuan Chou, Isaac Kamola and Tamson Pietsch and contributors, address these questions in The Transnational Politics of Higher Education: Contesting the Global / Transforming the Local (Routledge, 2016). You can read more at the book’s Website. This entry was posted in Education, Global & International and tagged higher education, regional integration, universities. Bookmark the permalink. Next: Knowledge Policies and the State of Inequality: Instruments For or Against?